A fundraising carnival in San Diego is a fun way to raise money for your organization. With some planning, you can organize a carnival with games, rides and all of the classic foods that people love. Before you set up an event such as a carnival, you need to contact the city to register to receive a permit. You only need to do this if you are using public property for your location. You are required to pay a fee for public safety and a $150 application fee. The office encourages citizens to apply 60 days before the event and charges a $10 late fee if you apply after 60 days before the fundraiser. The City of San Diego application package has everything you need to acquire a permit for your carnival. Another beneficial resource for setting up a fundraiser in San Diego is the Association of Fundraising Professionals. You'll find a lot of helpful information about what steps to take when fundraising in the city as well as some ideas that have been successful for other people in the city. You'll need to contact carnival vendors to choose the items you would like, find out how much it will cost and schedule the date. To find a vendor, start with these websites. My Little Carnival: Create a traditional style carnival with red and white tents. The company will set up, run and take down everything if you wish. You can save money by having volunteers run the concession stands, booths and other entertainment. All you will have to pay for is the rental fee as well as the set up and take down of the carnival items. Your carnival can be as small as you need it to be or as large as you would like with different sizes accommodating 30 to 30,000 people. You have the choice of many different games such as Ring Toss, Fish Pond, Hoopla and more. 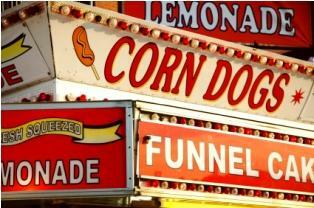 Foods include classics like fresh popcorn, cotton candy, hot dogs and more. For more information, visit the website or call 619-571-7654. Corporate Event Channel: This site has a list of companies you can rent bouncy houses from and other things to set up a carnival yourself. Christiansen Amusements: Rides are a big attraction to carnivals and can greatly increase its popularity. You can rent carnival rides and games from Christensen Amusements. They have kid rides such as Alligator Alley, Bees, Elephants, Fun Factory, Go Gator, Hampton Cars, Campton Cycles, Kreepy Kastle Lady Bugs, Merry Go Round, Mini Himalaya, Motorcycle Jump, Raiders, and Umbrella Cars. Major rides include Casino, Crazy Plane, Ferris Wheel, Octopus, Paratrooper, Round Up, Scooter, Scrambler, Slime Time, Super Slide, Zumar, and Tilt-A-Whirl. If you have a lot of room for the largest carnival rides for the fear free folks that come to the event, you may be interested in having one of the Spectacular Rides, which are Gravitron, Hurricane, Kamikaze, Scooter, Sky Diver, and Zipper. Contact local businesses to ask if they would like to advertise at the fundraising carnival. You can raise money this way by asking for a donation or have a fee set to allow them to set up a booth. Just make sure you have enough tables to accommodate all the businesses that agree to attend the event. Hosting a fundraising carnival in San Diego can cost a lot of money so you have to be sure you stay within a certain budget so you don't end up spending more than you make from it. If you don't have much money to start with, consider making many of the booths yourself by borrowing folding tables from churches and local businesses. You can also have smaller games that you usually see at parties. You can set up inexpensive food stands by borrowing grills to serve hotdogs, hamburgers, kielbasas, etc. You may not be able to charge as much money for the games and foods, but you can make money in other ways such as having raffles in which you sell tickets for winning items that local businesses have donated. Being creative will be a sure way to bring in the most profits for your organization!